There’s a new generational group grabbing the fancy of writers who offer advice to employers and businesses. Can you believe it? The oldest Millennials are turning 40, and many are weary of the hype about them. So, here comes Gen Z.
Here’s a snapshot of the current Tri-Cities breakdown of generations. 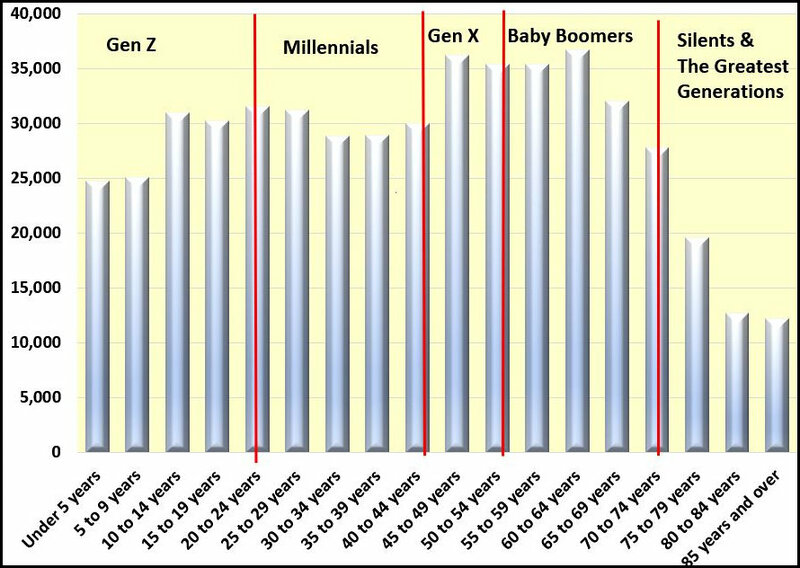 Remember Gen Z still has two more birth years and don’t have the mortality factor weighing on them as much as the elders. The area’s current birth-to-death ratio is 10-to-14. Clicking on chart renders a larger file. The oldest of Gen Z is 23, and as a group, they outnumber the Baby Boomers, but most are too young to flex their consumer and cultural muscles. We do know they’ve tech-savvy, goal-oriented and promise to make some major shifts in consumerism and politics. Researchers peg 1995 as the beginning of the nation’s largest demographic cohort. And the ending year is 2020. And estimating the size of each generation from the way the Census treats its population by age numbers is a chore. You must do some fudging because Census uses a four-year age spread that doesn’t lend itself to the beginning and ending generation birth years. But that doesn’t mean you can’t get a pretty good grip on the ranks of each generation. For instance, the seven-county Tri-Cities region had about 142,516 Gen Zers in its latest count. That’s 28% of the region’s population, and they’ve got another two years of pending births to go. 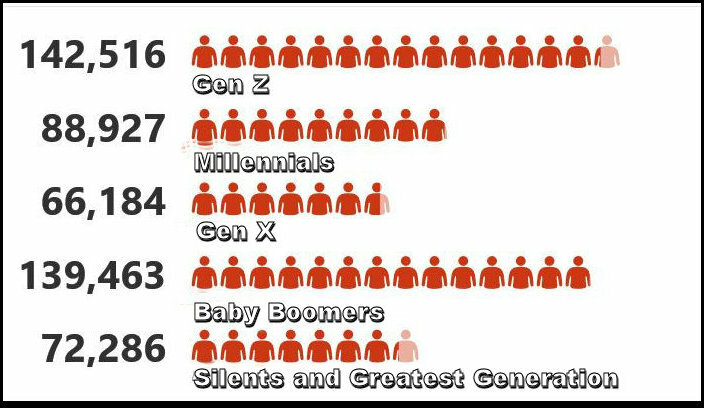 Compare that to the 139,463 Baby Boomer’s 27% share of the population, and you can see why Gen Zers are going to get a lot of attention. While I don’t want to throw cold water on the quest of “Marketing to Gen Z: The Rules for Reaching This Vast – and Very Different Generation of Influencers” and the other works that focus on the what, when and why of cropping on the market there just might be a bigger issue at play. There are currently 68,000 Tri-Cities residents on the front doorstep of old age. And just over that threshold, there are another 72,286 already there. Here’s an approximation of how the Tri-Cities generations look. The Silent and Greatest Generations were combined. Just for the sake of argument let’s set 70 as the benchmark for old age. Look at it this way. There will be an average of 18 area residents a day turning 70 for the next 10 years. And if you count the 50 and overpopulation, you’re looking at over 211,749 people. That’s about 42% of the region’s population, and it’s this group that has most of the money and will continue to dominate the politics and marketplace for the next decade or so even if their dominance is diminishing. They’ll retain some dominance because many of the Gen Zers will leave the area for college or better job opportunities. The stage is set for a big young tech-savvy generation entering the workforce and flexing its influence on the business community at the same time an almost equally large part of the demographic is entering old age and exerting their own unique influences on the economy. Some of those demands have a defined downside for services, but these elders also offer some opportunities if they not looked at as just problems that need to be dealt with. The demands they will make on the region’s housing market is just one example of what’s coming. For those elders with enough money options like five-star accommodations at The Blake are available. But check out its status. It’s not ready for move-ins just yet, and it’s already just about filled up. The area also has a variety of nursing homes. Some better than others and some are always being ordered to clean up their act by state officials. But many seniors – and their families – put nursing homes and funeral parlors on the same level. The big financial difference is the funeral home doesn’t get the deed to the elder’s property. You can’t put a precise number on them, but the number of seniors who have moved or been moved into apartments or other rentals is increasing. Many get daily visits from the relatives who couldn’t or wouldn’t move them into their homes. Others have the tell-tale lock box that gives home health care access. There’s also an increase in multi-generational households. And there’s a growing interest in granny pods. But that may be a heavy planning and zoning lift before it would meet the needs that are just around the corner. There are also some examples that cohabitation is a coming trend for older folks. Think of the Golden Girls TV series. Who would have thought it was ahead of its time? And have you heard of the Beacon Hill Villages concept? As we get deeper and deeper into the aging trend, you probably will. Housing is just the tip of the iceberg. Elder abuse has the potential to become a rival in numbers to child abuse. Some of the unique challenges – and yes real-time capitalism opportunities – also come with the rising tide of older folks. Joseph Coughlin, head of the Aging Lab at MIT, lays the groundwork and offers some solutions in “The Longevity Economy: Unlocking the World’s Fastest Growing, Most Misunderstood Market” It’s a highly recommended read for local government officials and business people. And then there’s Gen Z knocking at the labor market and economy’s front door. Fasten your seatbelt and hang on.